Thank you all for visiting us at our first VINTAGE CONCERT AUDIO SHOW ever at ProLight + Sound in Frankfurt 2019. We were really overwhelmed with inquiries about the vintage equipment we showed. So many people told us they love the idea of being able to experience analogue vintage concert audio equipment. So our daily little tours, where we showed how those old systems sounded and explained what the differences were, were soon the highlight of the day. Also many people liked our daily discussion panels where we invited sound engineers, loudspeaker manufacturers, recording engineers / producers and local promoters to talk about the good old times and how the concert audio world and tour life changed over the decades. And also we on the panel and our audience had lot’s of fun listening to stories from some of the veterans in our business. After all we must say we are willing to do it again. We are talking with people organizing events in China, the US and the UK. Maybe we are going on a world tour. Maybe not. We don’t know now. It is a lot of work putting a show like this together. And without sponsors it would be absolutely impossible to do this. All people at the Vintage Concert Audio e.V. work voluntary and therefore get no salary. This works only because we are hunters and gatherers and we want to preserve the heritage of analogue audio technology. 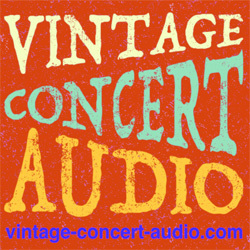 Vintage Concert Audio e.V. is a non profit organization and we need money from sponsors to keep the doors open. If you are willing to support us please let us know. Thank you.